After much searching I have concluded that this fellow is a Common Buzzard, unless someone tells me otherwise! 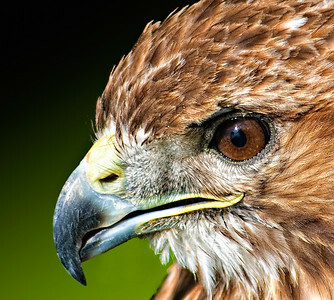 A native species of Great Britain the Common Buzzard is most commonly seen in the countryside gliding with outstretched wings which have tips like 'fingers'. 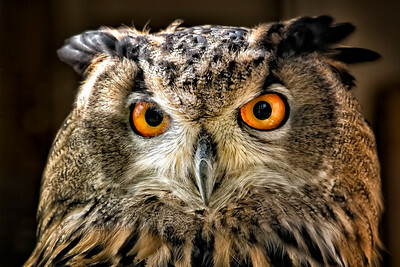 Eagle Owl at the National Bird of Prey Centre in Newent, Gloucestershire. 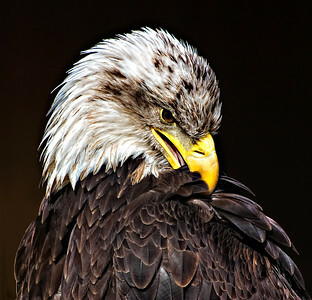 The American Bald Eagle is well known as a fearsome bird of prey but as he delicately preens his feathers you'd be forgiven for thinking that he was just a gentle giant! I had seen this Kestrel earlier in the day flapping its wings and decided to come back later to try and get a photo in better light. 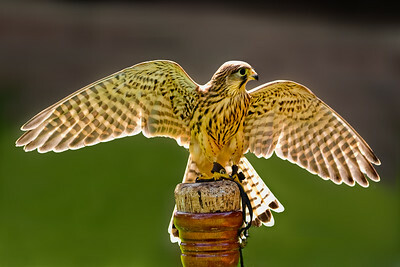 The sun was much lower and I found a position where the sun was behind the bird. Then it was just a case of waiting for moment, that ‘once in a lifetime’ shot. 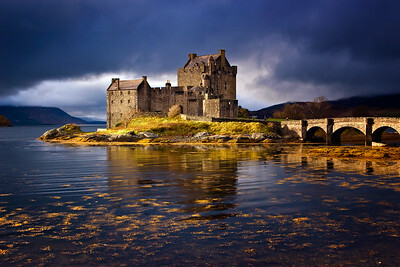 Lying on Loch Duich on the West Coast of Scotland this superb castle is seen here on a November afternoon catching the last rays of sunshine before the storm. 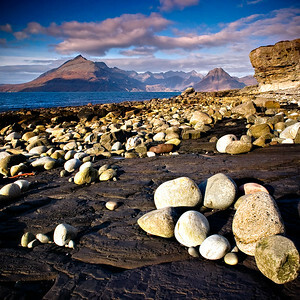 The classic shot of The Black Cuillins from the beach at Elgol in some rather cool light. 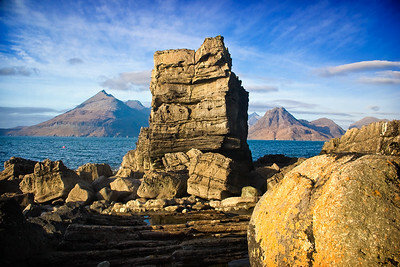 A fair old walk along the beach from Elgol you will find this magnificent mini sea stack. 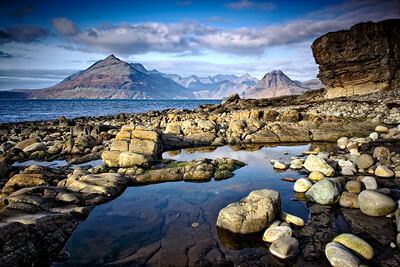 This photo breaks the normal rules of composition but the rock just demands centre stage and is nicely framed by the Cuillin mountains beyond and by the rocks on the shore. 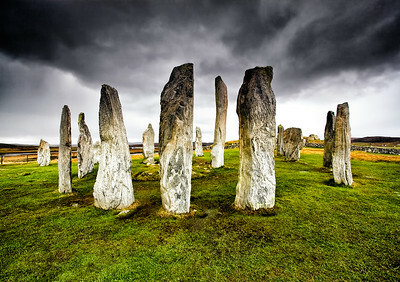 The ancient stone circle at Callanish on the Isle of Lewis in The Outer Hebrides is over 4,000 years old and one of the oldest such structures in the world. Though smaller than Stonehenge it is considerably older and is awe-inspiring to visit. 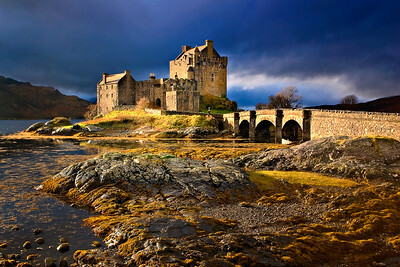 Normally seen in sunshine, here we have a photograph taken beneath an umbrella as a storm passed overhead giving this magical place an altogether unworldly quality. 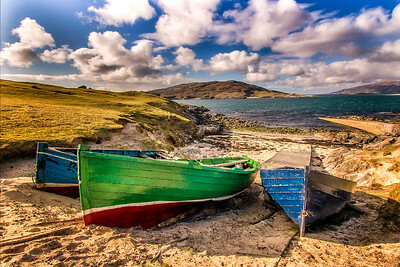 The island of Scarp was inhabited until 1971 when the final few residents gave up and moved to Harris. The only way across to the island was by boat from this point. Boats are still kept there today but mostly for fishing. 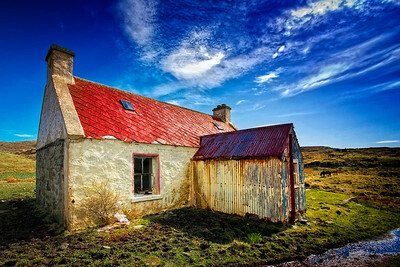 Croft House, Eriskay, Outer Hebrides, Scotland This abandoned croft house on the Isle of Eriskay is typical of many such houses in the Outer Hebrides. After the First world War simple 'modern' houses were built to replace the old stone and thatch black houses. They were often modelled on the black house with just two rooms and extensions and additions were made later using whatever materials were to hand, in this case corrugated iron. Eriskay is home to a breed of ponies found living wild only on this island and a couple can be seen in the background. 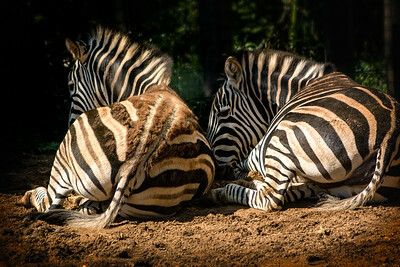 Caught these two a while ago at London Zoo trying to find a bit of shade on a scorching hot day. On a scorching hot day this fellow was trying to get some shade and I was struck by how well the camoflague of the stripes worked - it's almost as if he is hiding within himself. 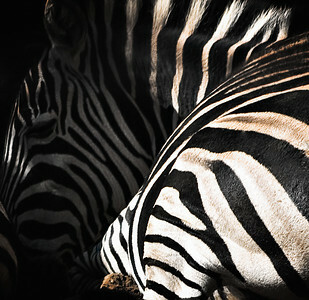 Animal or art? Perhaps the art of nature itself. with a hint of brown. 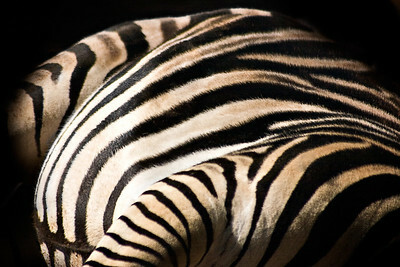 A Chapman's Zebra caught lying in the shade of a tree. 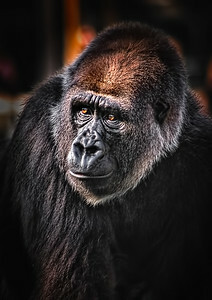 I think this a Lowland Gorilla but no matter which species these creatures are always amazing. 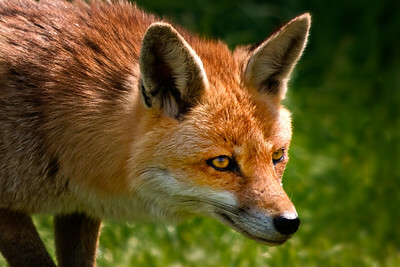 When you get in really close and can see their eyes you can tell that they are _thinking_. 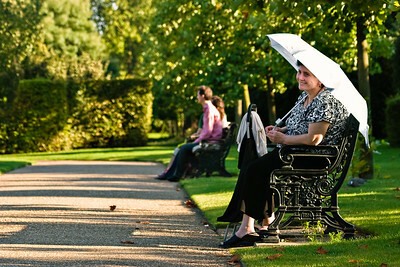 Just a lovely lady with a beautiful smile taken in Regent's Park, London on a beautiful, sunny, day. 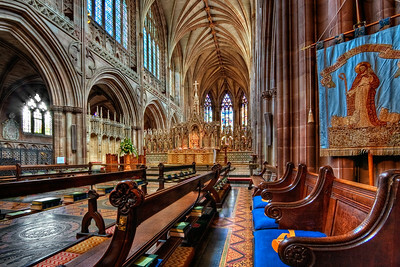 Lichfield Cathedral in Staffordshire, England. 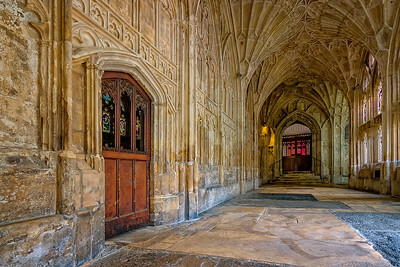 In the cloisters at Gloucester Cathderal in England are some magnificent wooden doors which must have been used by clergymen for hundreds of years. Who knows what is behind them? Here is one such door. On the opposite side another similar door is open lettting light flood in from the centre of the quadrangle. 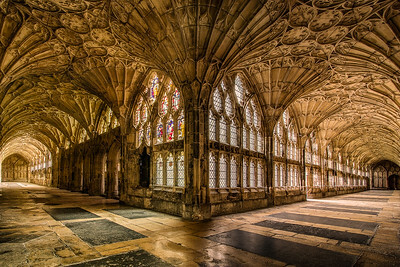 The magnificent cloisters at Gloucester Cathedral, England which run in a quadrangle to one side of the cathedral. There are many shots to be had here but I wanted to try and capture two sides of the quadrangle in one shot. With the lens set at its widest setting of 10mm and the camera right against the wall (with me lying on the floor beneath the tripod!) I was able to get this shot which gives a great sense of which way to turn. 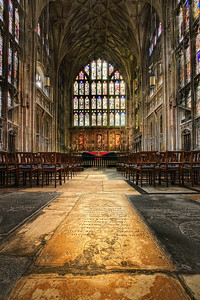 Gloucester Cathedral in England has a certain warmth inside from the light reflected through its massive windows on to the soft yellow stone that makes up much of the building. Here the floor of the Lady Chapel, polished by a million passing feet, reflects the light. From the outside St.Giles Roman Catholic church in the English town of Cheadle in Staffordshire looks like any other church from the 19th century. 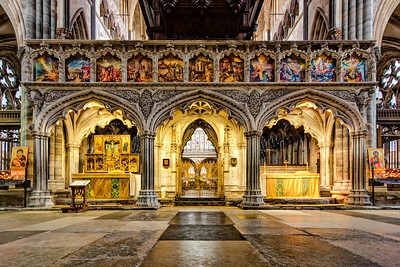 Pass through its doors however and you are greeted with an astonishing, no expense spared, opulent recreation of a 13th century church at the height of the church’s power and influence. Every square inch of the floor is covered in hand crafted Minton tiles, every inch of the walls, pillars and ceilings are intricately hand painted and there is more gold paint around the altars (maybe even the real stuff) than you will ever have seen. The church was designed by A.W. 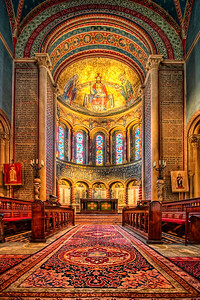 Pugin and is considered to be his finest work. 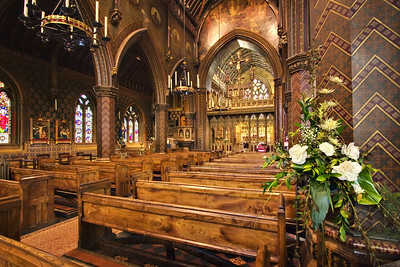 It was commissioned in 1841 by the 16th Earl of Shrewsbury who lived in the nearby mansion of Alton Towers and who offered Pugin all the money he needed to create a masterpiece. He certainly fulfilled his commission and created the most amazing of churches. I knew nothing of this church until a friend suggested that it might make a decent subject for a photograph or two and how right she was! No one photograph can do justice to this amazing church so, over time, I will aim to give it a feature of it’s own in my portfolio, I certainly have enough photographs to do so – keep checking in! A simple bunch of white roses adorns an inticately painted pillar in St. Giles church in Cheadle, Staffordshire one of England’s finest churches. Although a captive animal it still takes a lot of patience to get a decent photograph as the animals at the British Wildlife Centre are in large enclosures with plenty of natural shelter. Spent a good few hours waiting, waiting, waiting for this shot. 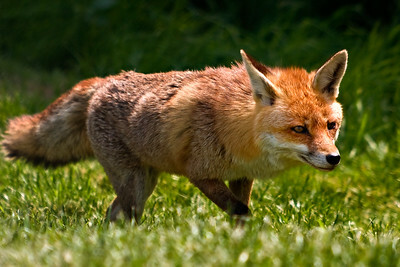 Looks to have his eye on something! Tewkesbury Abbey, Gloucestershire, England Abbeys tend to be far less ornate than cathedrals but no less grand in their design. 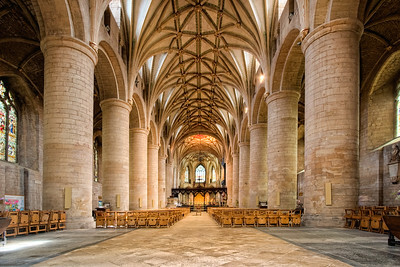 Tewkesbury Abbey is a good example with its huge open nave and massive simple unadorned pilars. Here there is beauty in simplicity and a peace in the openness. Simple. Elegant. Beautiful. Winchester Cathedral, Winchester, England Most people are familiar with Anthony Gormley’s statutes on Crosby beach which are engulfed by the incoming tide bit may not be familiar with the same concept in Winchester Cathedral. 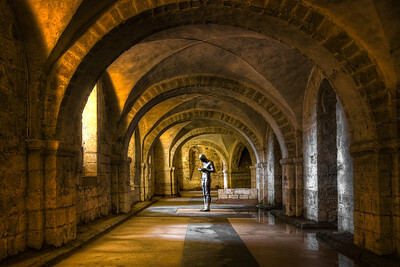 Here one of Gormley’s figures stands in the crypt silently contemplating a cup of water in it’s hands. During wet weather the crypt floods and the stature stands knee deep in water much as those on Crosby beach. Unfortunately it is next to impossible to get a photograph at that point as the crypt is closed to visitors when flooded. St. Mary & St. Nicholas Church, Wilton, Nr. Salisbury, Wiltshire, England The church in Wilton is a fantastic 'Italianate' church built between 1841 and 1844 at the instigation of the Countess of Pembroke and her younger son Baron Herbert of Lea. Inside is a magnificence of colour with marble imported from Italy but outside is classic Romanesque architecture. 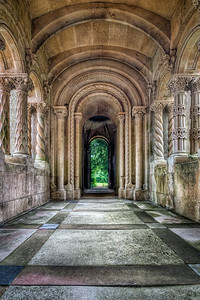 Here is one of the side entrances to the church, a colonnaded walkway with classic highly decorated archways. Beautiful. 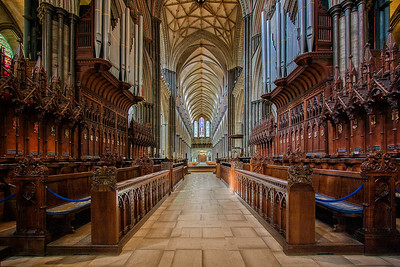 Salisbury Cathedral, Wiltshire, England The magnificent choir at Salisbury Cathedral is a masterpiece in mirrored design. There are subtle differences but it look almost like a trick of processing where one side is flipped to create the other. Imagine how many years of the craftsmen’s lives went into creating such detail many centuries ago. 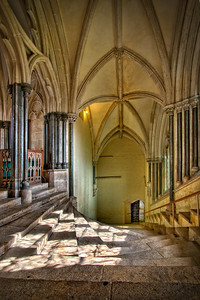 Salisbury cathedral seems to me to be quite different to other cathedrals. 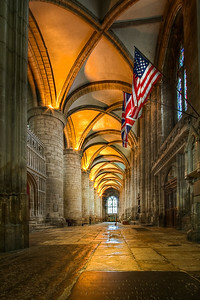 Despite being dedicated in the year 1258 it seems to be much more modern than cathedrals of that time, perhaps because of the materials used such as the granite floors and the brick linings to the ceilings. 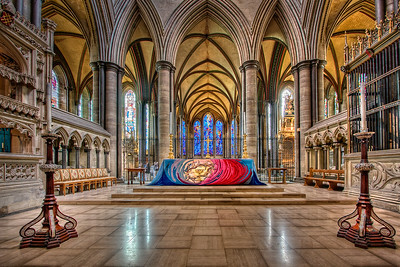 In this particular photograph the altar cloth is thoroughly modern adding to modern feel. 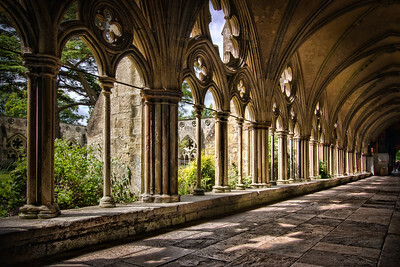 A nice bit of dappled sunlight in the cloisters at Salisbury Cathedral. 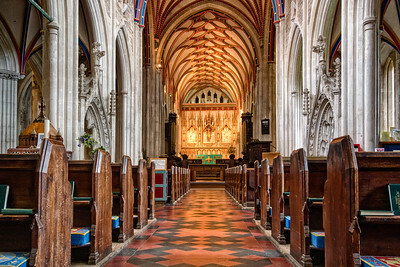 Believe it or not this is another English Parish Church in a small English town. The church was built between 1841 and 1844 on the site of the medieval Church of St. Nicholas, at the instigation of the Dowager Countess of Pembroke and her son, Lord Herbert of Lea at a cost of £20,000. The Countess was of Russian descent and wanted something grand so commissioned architects to design the church in a Romanesque style, as an imitation of a basilica in Lombardy. The influence of members of the Pembroke family in the style and fittings was considerable. 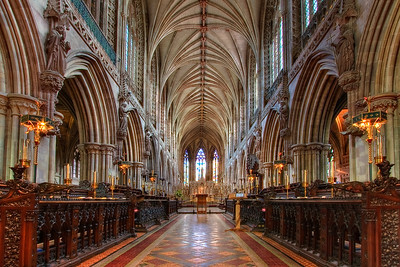 There is an aisled and clerestoried nave with an aisled chancel and an apse. A campanile, 105 feet high, is connected to the church by a short cloister. 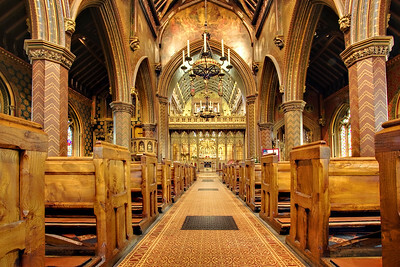 Much material of early workmanship was imported from Europe and incorporated into the church. Examples are the marble columns at the southern end of the side aisle which came from a 2nd century B.C. Temple of Venus at Porto Venere, and 12th and 13th century stained glass from France that was set in the central apse window. Glass from the old chapel at Wilton House was also included. Many tablets and memorials were brought from the old parish church of St. Mary, which was partly demolished in 1845. The six bells from there were also recast for the new church. The church was consecrated on 9th October 1845 and three charities were established for its maintenance. The simple parish church of the village of Ottery St. Mary in Devon named after its church. 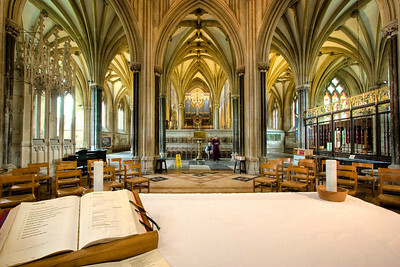 The beautiful Gothic nave at Exeter cathedral presented as an almost prefect mirror image. 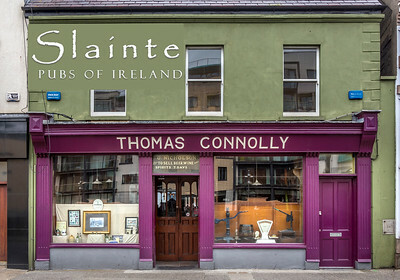 A nice mix of old and new with beautifully balanced colours on the stonework and furnishings. 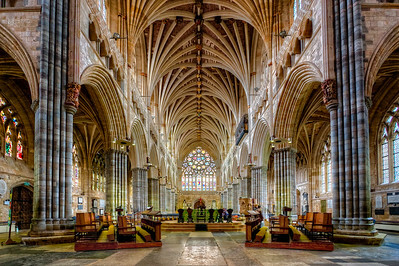 Wells Cathedral, Somerset, England. 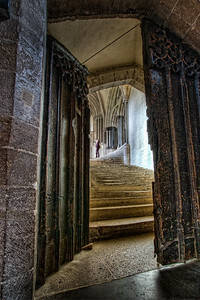 A long climb up a fabulous stone staircase in one the the less public parts of the cathedral. 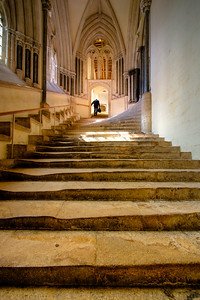 Wells Cathedral, Wells, Somerset, England Away from the main body of cathedral is this fantastic staircase which is also featured in my photo The Long Climb . I would have taken the shot anyway as a purely architectural photo but the ‘ceiling admirer’ I think gives it a different focal point. What do you think? 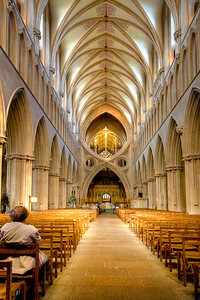 The Nave in Wells Cathedral, Somerset, England showing the famous Scissor Arches, a unique structure in English cathedrals, Although the design and construction looks quite modern the arches were constructed between 1338 and 1348 after cracks began to appear in the tower due to unstable foundations. 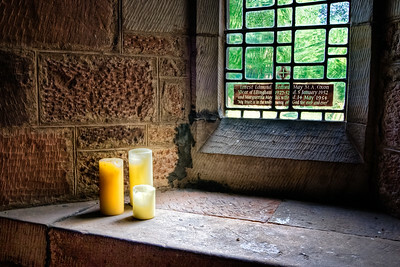 St. Maurice church, Ellingham, Northumberland, England I visited the church to take my usual shots of the interior but this simple placement of candles captivated me. I knew it would make a good photo. An interesting, rather utilitarian church on the border between England and Scotland. 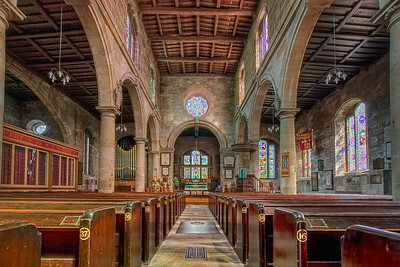 The numbered pews are quite unusual as is the enlcosue to the left. 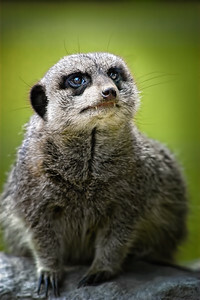 Meerkat at Eagle Heights Bird of Prey Centre, Kent, England Well I could have just called it Meerkat but it's not often you get to see their teeth! This one looks almost as if he had come into the studio for a portrait! 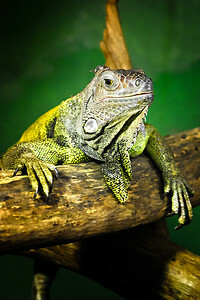 Don't you just love Iguanas? Okay, at least I do.